Bolands of Ireland Fig Rolls Fig rolls are sun drenched figs baked in golden pastry. Delicious..
Burts Guinness crisps are a thick cut, hand cooked, potato chip with Guinness flavour. 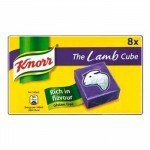 ..
Knorr's Chicken Stock Cubes are easy to use and will enhance the flavour of any dish. Just..
Knorr's Ham Stock Cubes are easy to use and will enhance the flavour of any dish so try adding them ..
Knorr's Lamb Stock Cubes are made with carefully selected herbs and spices and will enrich any lamb ..
Knorr's gluten free Vegetable Stock Cubes are easy to use and with their tasty blend of herbs and sp..